Crunchyroll made a big announcement at Anime Expo today. In addition to the reveal of some new anime licenses, the streaming service announced plans to bring some of its current anime lineup and other surprises to the physical realm of Blu-ray and DVD. Leading the charge is Crunchyroll's acquisition of the rights for merchandise and home video for smash-hit original anime Kabaneri of the Iron Fortress. Not only will the series be coming to Blu-ray and DVD, but Crunchyroll will also be producing the English dub and working with partners and in-house to create merchandise. Crunchyroll will have more Blu-ray and DVD titles to announce in the future, but for now these are the inaugural plans. Breaking News: #OnePunchMan is coming to Toonami. Toonami is proud to announce the newest anime joining our line-up: One-Punch Man! Premiering July 16 at midnight. Jojo's Part One anime confirmed for Blu-Ray. No release date yet. Viz Media announced at a JoJo's Bizarre Adventure panel at Anime Expo on Friday that it will release Part 1 (Phantom Blood) of the new JoJo's Bizarre Adventure television anime series on Blu-ray Disc. The company confirmed that Warner Bros. Home Entertainment, who released Parts 1 and 2 in a DVD set, still holds the DVD rights to the series. Nozomi Entertainment announced its license for Galaxy Angel, the science fiction comedy anime directed by Morio Asaka (Sword Art Online, Gunslinger Girl, Chobits) and featuring animation from Madhouse (Black Lagoon, Death Note, Magic User’s Club). Galaxy Angel consists of 26 episodes and focuses on The Angel Brigade, an elite branch of the Transvaal Empire military, as they travel to different planets using their specially designed ships to search for "Lost Technology." Unfortunately, they often mess up and land in all kinds of awkward situations. Galaxy Angel will be released in early 2017 on Blu-ray with English and Japanese audio with English subtitles. Martian Successor Nadesico will be released on Blu-ray in 2017 in a complete collection containing the entire 26-episode TV series as well as the Nadesico Prince of Darkness movie. The set will feature English and Japanese audio with English subtitles. Check out our upcoming fall bluray release, A Town Where You Live! Get to the batting cages and practice your swing for Big Windup! 2 this fall! Right Stuf, Inc. and Sunrise Inc. are excited to announce that the following Mobile Suit Gundam sequel series titles will be released in the coming months: Mobile Suit Gundam 0080 War in the Pocket, Mobile Suit Gundam F91, Mobile Suit Gundam 0083 Stardust Memory, and Mobile Suit Gundam 0083 Afterglow of Zeon. Mobile Suit Gundam 0080 War in the Pocket will be released on DVD in late 2016 featuring English and Japanese audio with English subtitles. Mobile Suit Gundam F91 will be released in early 2017 on DVD and Blu-ray featuring English and Japanese audio with English subtitles. Mobile Suit Gundam 0083 Stardust Memory will be released on DVD and Blu-ray in early 2017 featuring English and Japanese audio with English subtitles. Afterglow of Zeon (also known as The Last Blitz of Zeon) will be released for the first time ever in North America on DVD and Blu-ray in early 2017 and will feature Japanese audio with English subtitles. 0080 will be released on DVD, but currently there aren't any plans for a Blu-ray as of yet. As for The 08th MS Team, we can't comment on it as of yet, but please keep an eye out for future announcements! HOUSTON, July 2, 2016 – Today, Sentai Filmworks officially announced plans to dub, not one, but seven fan favorite anime titles from the Spring 2015 through Summer 2015 simulcast seasons. 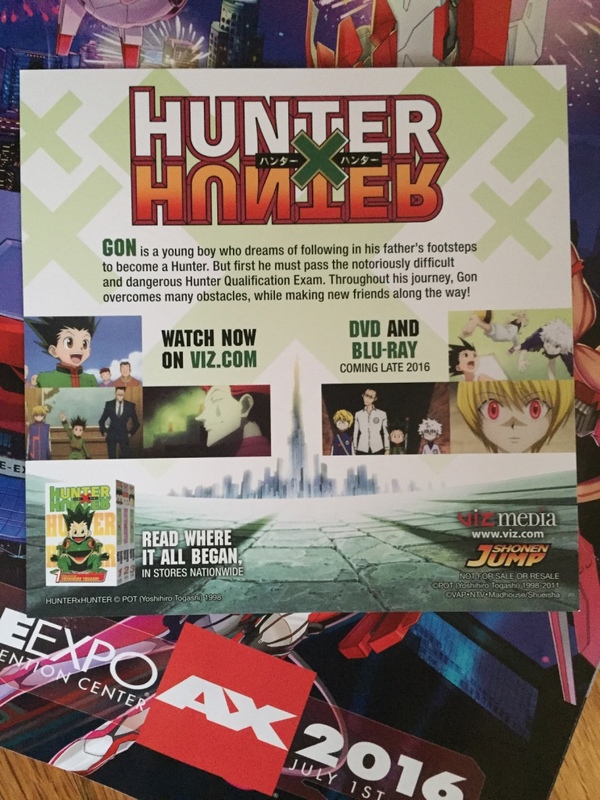 The titles were announced during the Sentai Filmworks panel at Anime Expo 2016. Monster Musume: Everyday Life With Monster Girls simulcasted during the Summer 2015 anime season, following the exciting (in more ways than one) exploits of a young man who finds himself housing one beautiful monster girl after another. The Spring 2015 fantasy Is it Wrong to Try to Pick Up Girls in a Dungeon? follows the Hestia Familia’s only adventurer Bell Cranel as he fights monsters in an underground labyrinth. Food Wars! simulcasted during the Spring 2015 and Summer 2015 anime season. This delicious adventure pits Yukihira Soma head-to-head with talented chefs in the world’s most competitive culinary high school. The hit comedy Himouto! Umaru-chan demonstrates that the differences between your “outside face” and “inside face” can be shocking. Umaru is a refined beauty in public and cola-binging, potato-chip-eating otaku at home where she becomes her big brother’s problem. Ushio & Tora is an action-packed shounen anime that ties the fate of a headstrong young boy with the fate of a fearsome yokai trapped by the Legendary Beast Spear. With a common enemy, Ushio and Tora find themselves working together to save the world. GATE follows Yoji Itami through the mysterious gate that appears suddenly in Japan, bringing with it legions of invaders. He’s sent with the JSDF to the “Special Region” where he meets and befriends an elf, a demigoddess, and a mage despite political tensions between the Empire and Japan. Amagi Brilliant Park is an adventure within the walls of a theme park like no other, where much of a park’s otherworldly staff is nourished by the energy created by humans having fun! Seiya must use his many talents to successfully manage the park before it, and its employees, disappear. Just announced from the president of Studio Bones is Show by Rock shorts starting in July on FunimationNow! Last edited by WTK; 07-04-16 at 06:02 AM. LOS ANGELES, CA July 3, 2016. Moments ago, at its annual Industry Panel at Anime Expo 2016, Funimation Entertainment revealed to the capacity audience its acquisition of “Drifters” – the eagerly anticipated new anime series from “Hellsing” creator Kouta Hirano. Funimation has secured international rights to home entertainment, video on demand and broadcast distribution of the title from NBCUniversal Entertainment Japan. “Drifters” is set to premiere this October on the company’s subscription streaming service, FunimationNow, in the U.S., Canada, U.K., and Ireland. “Drifters” is based on the immensely popular, 5-volume manga series of the same name. Writer Kouta Hirano, best known for his highly successful “Hellsing” series, leads the creative team for the series. He is joined by fellow “Hellsing” alums Kenichi Suzuki (director) and Ryoji Nakamori (character designer) among others. “With the addition of ‘Drifters,’ Funimation can already assure fans of an exciting fall simulcast season, both for subtitled shows and Broadcast Dubs (near-simulcast English dubbed shows),” said Mike DuBoise, EVP and COO of Funimation. We’re excited to announce today that we will be releasing Your Name (Kimi no Na wa), the newest gorgeously animated film from prestigious director Makoto Shinkai, in theaters and on home video. If you’re not familiar with Director Shinkai’s work, you need to be—Variety named him one of the top 10 “animators to watch” for 2016 (and the only Japanese director on that list), and also listed him as one of the top anime directors after Hayao Miyazaki’s retirement, along with Boy and the Beast director Mamoru Hosoda. Makoto Shinkai’s films (Voices of a Distant Star, 5 Centimeters Per Second, Garden of Words, and more) are known for being absolutely visually stunning, with lush fantastic backgrounds, lovingly-rendered skies and starscapes, and a penchant for making everyday modern environments more beautiful than life. They’re also known for being emotionally touching, with stories of love, connection and meaning. If you have any interest in the world of animation or anime creators, definitely check out his new film (and get your tissues ready). Look out for more news about Your Name in the months to come! Full house at the Blue Exorcist 5th Anniversary Panel with author Kazue Kato! We can't wait for the new season - Kyoto Saga - coming in 2017! Ponycan USA confirmed with ANN on Thursday that it is planning to release the Kuromukuro, The Lost Village (Mayoiga), DAYS, and Cute High Earth Defense Club LOVE! LOVE! anime in the United States. The company did not provide the format of the release, or the release dates for the anime. GKids has acquired U.S. distribution rights to the Japanese animated drama “Miss Hokusai,” which won the jury prize at last year’s Annecy Film Festival. “Miss Hokusai” will be released on Oct. 14 in New York and Los Angeles prior to a North American expansion. The production company is Production I. G.
1 U.S., Canada, U.K. and Ireland. Premiere date same for all countries unless otherwise noted. 2 U.S. and Canada only. 3 Carryover from spring season. We picked the release date for the Sonic X seasons 1 and 2 collection. It will be released September 27th. This has episodes 1-52 of the English dubbed series. Season 3 will be released in another collection at a later date. We are working through the backlog of titles left to release. The Street Fighter II animated TV series will be out on September 27th. Finally finished this one. Street Fighter II the animated movie will be out on Blu Ray in October. We also picked up Koi Koi 7, the DVD set will be out in September. We also decided to release Tekkaman Blade II on BD. September 27th is the release date. We plan to announce some new licenses at the Discotek Media panel at Otakon in August! We will also have more news on the remaining unreleased titles including Rayearth TV on BD and the Lupin 2nd series. We do listen and when people told us the home video version released in Japan was on BD and no blurring for TV, we acted and was able to get the BD version not blurred and looks pretty darn good. We will be announcing a BD and a program where your DVD can be upgraded to the BD version. Before you all ask unfortunately still at this time there is no M&E's for the program so we can not create the english language less at great cost. We've got some new BL catalog coming your way today as Gakuen Heaven launches for Crunchyroll members in US, Canada,UK, Ireland, Australia and New Zealand at 4pm Pacific Time! HOUSTON, August 3, 2016 – Sentai Filmworks is proud to announce its acquisition of Little Busters EX. Adapted from the visual novel Little Butsters! Ecstacy, this eight-episode OVA series expands on one high school boy’s adventures into a world that isn’t always what it seems to be. This reimagining of the Little Busters storyline pits protagonist Riki Naoe against familiar faces such as Saya Tokido, a treasure hunter in hiding from an elusive group known as the Dark Executives, and Kanata Futaki, young chairwoman of the so-called "Public Morals Committee" who seems to have a sinister agenda of her own. Little Busters EX was directed by Yoshiki Yamakawa (Little Busters!, Hatsukoi Limited), with series composition by Michuru Shimada (Little Busters!, Shugo Chara!). J.C. Staff, the same studio that produced Tantei Opera Milky Holmes, A Certain Magical Index, and Golden Time, helmed animation production. Any idea where and when this new Pokémon movie premieres? There's nothing in the link on this. I would not be surprised if the English version gets presented before 2016 ends. Last edited by WTK; 08-04-16 at 07:45 PM. According to Sentai, Legend of the Galactic Heroes is still in process. They confirmed they have the main series, Gaiden, and the 3 movies. Last edited by WTK; 08-12-16 at 03:17 PM.